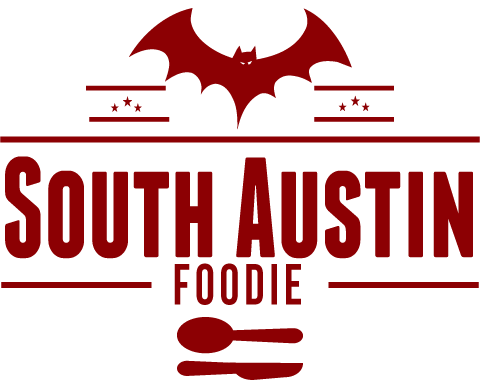 South Austin Foodie: Odds and Ends! Went 2 weeks ago to Luke's Inside Out, the trailer adjacent to the Gibson Bar; my first time at either place, actually! How can you not love a place that calls their sandwiches by what they are: The Pig, The Cow, The Cheese, etc. So of course, I had The Pig (duh! ), which was quite a tasty little number. The full description: pulled pork, with bacon, mozzarella, chow chow, bbq sauce, and onion rings. Messy though! Very nicely done, and a nice contrast of sweetness with the addition of pickled peaches, I believe. 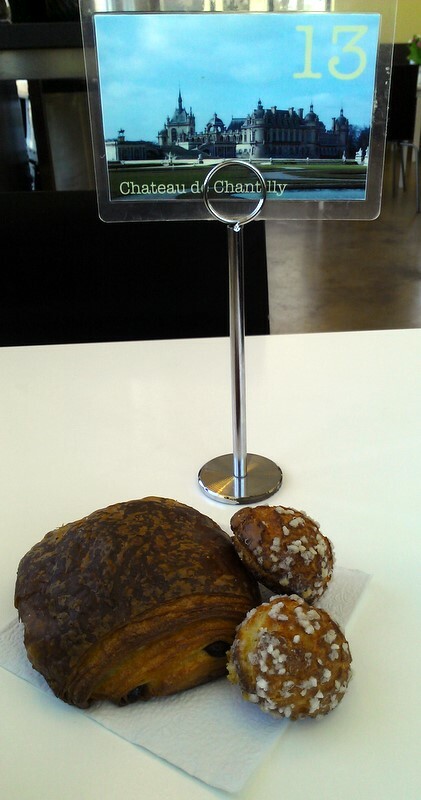 Last week, I got a slight wild hair and drove out to Baguette et Chocolate at 2244 (Bee Caves) and Hwy 71. Located in a non-descript newer retail/office park, they are a sophisticated French bakery that I have heard great things about. Apart from the fact they were out of almond croissants when I arrived for an early lunch, I was not disappointed, and it was delicious. 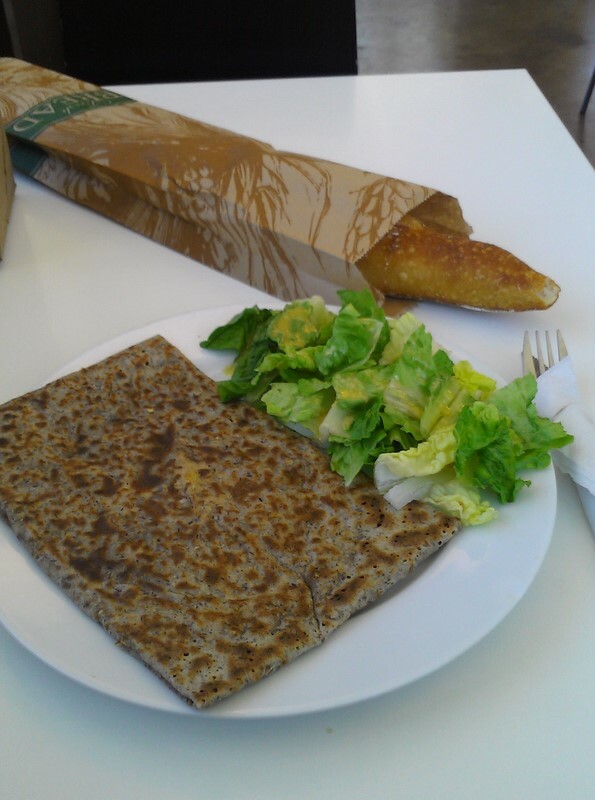 I had a lunch of crepe complete -- a buckwheat crepe (traditional for savory crepes in France) with egg, ham, and Swiss cheese, with a small side of greens. A little to my surprise, it comes folded into a rectangle, but that had no affect on how tasty it was! Very nicely pan seared, not only so the cheese melts, but so the outer edges become crispy. They have a ton of savory and sweet crepe choices, it was hard to narrow it down! Must go back and try other varieties! I had picked out a chocolate croissant for the following day's breakfast (it got slightly burned heating it in my toaster oven, but it seemingly had a thousand little layers to it! ), an order of choquettes, little light as air bite-sized cream puffs with coarse sugar on top, and a sourdough baguette to go with some soup already at home. Wished they had demi-baguettes, because that full loaf was addictive.Very cute little place, though too bad it IS such a drive! This past Friday, I went to Chen's Noodle House, another favorite spot, even though it is WAY the heck up north! (Well, northwest.... 183 and Spicewood Springs). I was a little concerned that they'd be too crowded with no place to sit (it's a tiny spot), or they'd be out of the really good stuff. Fortunately, by the time we got there, close to 8 pm, it was only half full, and they were out of two items I wasn't as interested in. We started with the green onion pancakes, which are as fine as you will find anywhere. Crisp and flaky, slightly soft on the inner concentric circle layers.... Could have eaten a whole lot of those! We had the lamb skewers next; 8 metal skewers with 4 or 5 pieces of tender, succulent lamb on each. These were done with a spicy (and a bit salty) szechuan peppercorn rub, that also had some heat to it. They were grilled perfectly, and just melted in your mouth. In my excitement, I failed to take pics of the pancakes or the lamb, ooops! 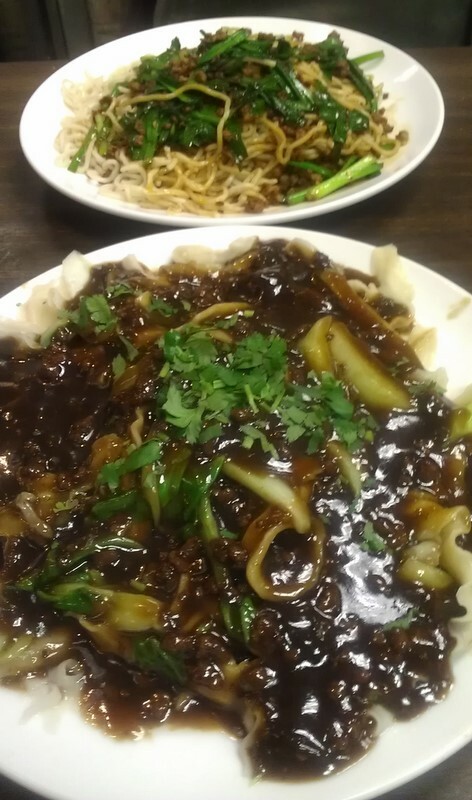 I had gotten a tip from a friend to try the noodles with black bean sauce, but to get them with the handcut noodles, which they did without hesitation when we asked. Such great flavor in the sauce, it was really perfect with those wider irregular noodles. We also had the thin noodles with ground lamb, which was quite good, but not quite as good as the first one. 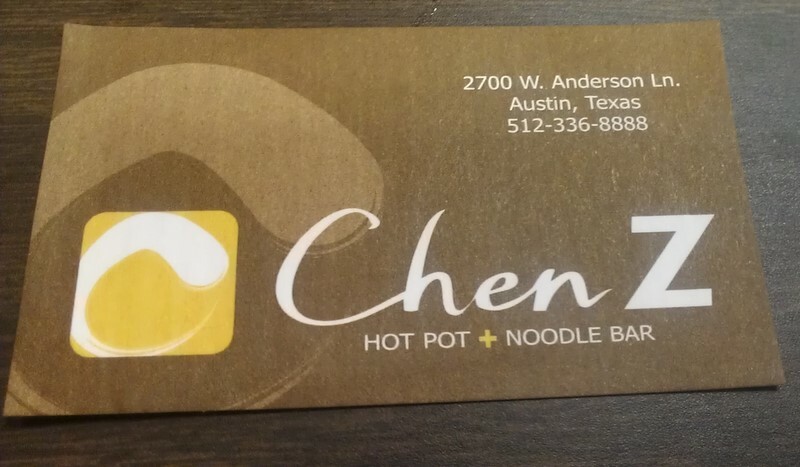 While at Chen's, we heard another customer talking to the man behind the counter (Chen himself? 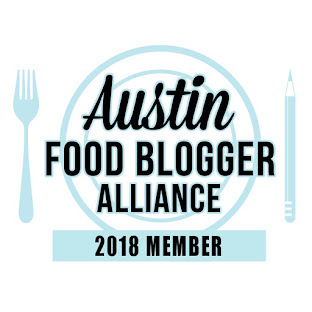 ), and got the scoop: they are opening a LARGER location on Anderson Lane! Hopefully within 3 weeks (so right before Christmas?). And hot pots!!! It's in the same shopping center as Korea House and the Alamo, which will definitely make it closer for those of us down south!!! After dinner, we walked across the strip center to the site of Sambet's Cajun Deli. Unfortunately, they had a fire at Thanksgiving, while deep frying turkeys. Their damage was heavy, and even spread a bit to neighboring businesses. Dynasty Chinese next door remains closed. Ann's Kitchen, a cake shop, is closed as well, but the note on their door said they are still filling cake orders, which could be picked up a few doors down at the pharmacy. Fortunately, Asia Cafe was spared any damage. 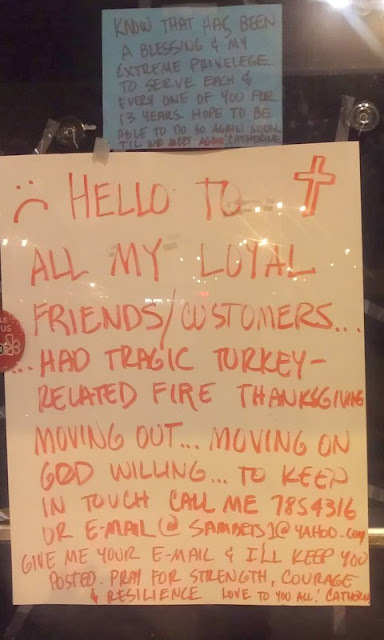 And judging from the note on the door, it doesn't look like Sambet's will reopen. And tonight, I just got home from a dinner with good friends at Enoteca, always one of my favorite spots, and here in the neighborhood. We shared everything: suppli, pork rillettes, duck confit salad, gnocchi, and carbonara, but with tagliatelle, not spaghetti. And wine. And polenta almond cookies for dessert. Now it's cold out, my plants are covered, and it's time to make more hot tea! 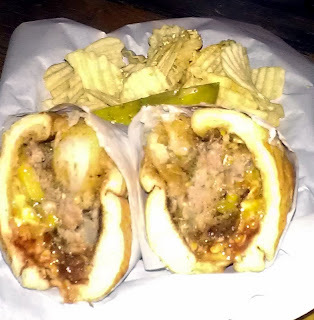 OMG, I want that Pig sandwich right now. Looks amazing.